LASIK surgery uses the latest in technological advances to correct a number of refractive vision disorders. LASIK stands for laser in-situ keratomileusis and has demonstrated to be hugely effective in correcting and reducing the refractive vision disorders that it is used to treat. This surgical procedure makes use of a highly precise laser to carefully reshape the cornea to the desired results. The reshaping is done after a protective flap of tissue, called the corneal flap, is created by lifting up tissue from the eye in order to allow the laser better direct access to the cornea. This method of refractive surgery is just one of several types routinely done, but the rapid vision recovery and greatly minimized discomfort of LASIK makes it the most popular choice for those looking to repair their eyesight. 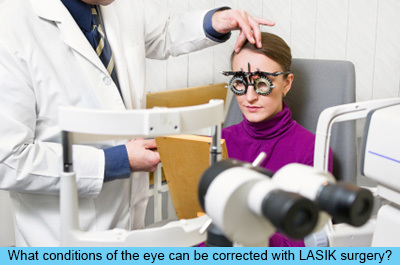 LASIK surgery can correct three types of refractive vision disorders. The three types of refractive vision disorders are Myopia (nearsightedness), hyperopia (farsightedness), and astigmatism. If you already wear reading glasses then there is a good chance that you will still need to use reading glasses even after you have LASIK, particularly if you are over the age of 40. Those who are nearsighted have difficulties seeing objects that are at a distance. Objects that are closer are typically seen with much greater detail. The distance at which objects become blurred can vary greatly between individuals, and can also worsen as the years go by. In nearsightedness, the eye that is nearsighted is actually longer than the normal eye. This means that the cornea is significantly steeper, so when the light filters through the cornea it is not focused on the retina but rather focused in front of it. This is what results in far off objects having a blurred appearance. LASIK surgery corrects myopia by flattening the cornea so that light entering the eye focuses on the retina rather than in front of the retina. LASIK can correct up to -8 diopters of myopia. Those who are farsighted have difficulties seeing objects that are close at hand, and typically have trouble with reading books or documents that are up close. In farsightedness, the eye that is farsighted is typically shorter than the normal eye. The cornea of the farsighted eye has a cornea that is flatter so that the blurred objects are focused behind the retina. LASIK is more limited in correcting hyperopia compared to myopia. Hyperopia greater than +3 diopters is very difficult to treat by surgery because if you can imagine, it is more difficult to add curvature to the cornea to correct for hyperopia, than it is to flatten the curvature of the cornea in treating myopia. When the cornea is unevenly steepened, it can result in objects having an irregular focus. Those who have astigmatism typically have blurred vision and may even describe it as doubled. This very a common refractive eye disorder, and can be found on its own but it can also accompany hyperopia and myopia. In the majority of cases LASIK surgery can effectively treat astigmatism up to -3 diopters. When you start looking into LASIK surgery you are bound to hear the term presbyopia periodically. But just what is this condition, and how could it prevent you from qualifying from LASIK surgery? Presbyopia is a type of visual condition that typically becomes more of a concern after the age of 40. As we age, the lenses inside of our eyes start to become more rigid, thus losing its ability to properly adjust focus at near objects. As presbyopia sets in it will become increasingly difficult to see objects that are up close such as reading a book, and will lead to needing reading glasses. Presbyopia also results in the individual being unable to easily readjust focus when switching between distance and near objects. Where it may have been easy to switch between looking at the clock across the room and then down at your watch, presbyopia will now causes a few seconds lag before you can switch between looking at distance to near. LASIK cannot correct the cause of presbyopia since presbyopia results from the lenses inside our eyes becoming more rigid due to aging and LASIK treats the front part of the eye, the cornea. However, there is a way to deal with Presbyopia using LASIK called Monovision. The dominant eye is treated with LASIK to have optimum distance vision while the non-dominant eye is treated with a modified prescription to allow you to see at near. In other words, one eye sees more clearly at distance and the other eye sees more clearly at near, however both eyes work together to see both distance and near. There are several medical concerns that may make it much more of a challenge for the LASIK to be successful. Your LASIK surgeon will screen you for glaucoma and retinal disorders prior to the procedure so that you can be assured of the best results. Regardless of whether you are looking for relief from myopia, hyperopia or astigmatism, you will find that the high levels of success with LASIK can almost guarantee that your vision will be greatly improved upon after your own procedure. A small percentage of LASIK patients will require a second surgery in order to completely attain the desired results, but effective communication with your ophthalmologist will help you to understand all of the risks associated with LASIK surgery.